A Wildcard SSL certificate secures your main domain along with unlimited subdomains under a single SSL installation. Instead of buying separate SSL certificates for each subdomain, you can secure them all with just one Wildcard cert. It will save you money, and precious time during the renewal period. Cheap Wildcard SSL is not a myth. The market offers a wide range of affordable Wildcard certificates; all you have to do is choose one that fits your online project the best. How do you know if you need a Wildcard Certificate? Easy. If you share your content over a subdomain (a separate division of your main domain name) than Wildcard SSL is the only option to encrypt your pages. Regular SSL Certificates can secure the main domain only. For instance, yourdomain.com. An unsecured subdomain spells trouble for your website. Search engines don’t like mixed HTTP and HTTPS pages and flag the entire site as not secure. You risk losing all your visitors, and your reputation is under threat. Here’s where Wildcard Certificates come to the rescue. They seamlessly encrypt complex websites with different subdomains, IP addresses or server storage options. Wildcard certs come in two options: Domain Validation for blogs, online portfolios, and small businesses, and Business Validation for e-commerce sites, medium-sized companies, and large enterprises. On top of that, Comodo (now Sectigo) CA offers a multi-domain Wildcard SSL solution, able to secure multiple domains along with unlimited subdomains. No matter how big and complex your website is Wildcard SSL will handle large traffic with ease. When applying for a Wildcard SSL Certificate, include an asterisk in front of the domain name during the CSR code generation. For example, *.ssldragon.com. With a Wildcard certificate, you can create as many subdomains as you want and then secure them all with the same certificate. Moreover, you can set up new subdomains whenever you need, and reissue your existing cert to encrypt them. A Wildcard cert streamlines the entire SSL management, saving time and money in the process. One payment, one installation, and one renewal to secure all your subdomains. Managing multiple servers across different subdomains has never been easier. Wildcard Certificates naturally cost more than the regular ones, but they are still within the range of any budget. Some SSL providers offer cheap Wildcard SSL certificates to meet the tightest of budgets. Imagine how much you’d have to spend on a separate certificate for each subdomain you set up if Wildcard certs weren’t around. Instead, at a fraction of the cost, you can secure all your present and future subdomains. Whether you need to secure a couple of subdomains for your personal website or a complex network of sites with huge traffic, Wildcard certificates are up to the task. Available as Domain Validation and Business Validation certificates, Wildcard SSL products secure personal websites, online shops, small businesses, medium-sized companies, as well as large enterprises. All Wildcard SSL Certificates follow the latest encryption protocols, namely 2048-bit key encryption and up to 256-bit certificate encryption. Cracking these algorithms is beyond human capabilities. Each certificate also comes with a static or dynamic site seal and a warranty against fraudulent issuance and data breach. Comodo (now Sectigo) is the most popular and budget-friendly Certificate Authority. Serving more than three million customers worldwide, this SSL provider offers the cheapest Wildcard SSL certificates on the market. Comodo Wildcard SSL products will perfectly integrate with any website or system. Comodo PossitveSSL Wildcard is by far the most affordable Wildcard cert. Since it’s Domain Validation, you can get it in under 5 minutes, without the paperwork hassle. Comodo PositiveSSL Wildcard is ideal for basic websites, online portfolios, and small businesses. It also includes a $10,000 warranty and a static site seal. Comodo EssentialSSL Wildcard is another cheap Wildcard SSL option that doesn’t require any paperwork on your part. It features a static site seal and a$10,000 warranty. Comodo Essential SSL Wildcard is perfect for blogs, basic websites, and small startups. Comodo Premium Wildcard SSL is a BV certificate, ideal for e-commerce websites, medium-sized businesses, and large organizations. Business Validation adds credibility and higher customer trust in your company. Paperwork is required, but if your documentation is up to date, the validation won’t take longer than 1-2 business days. Comodo Premium Wildcard SSL comes with a dynamic site seal and a $250,000 warranty. Comodo Multi-Domain Wildcard SSL certificates offer the ultimate sensitive data protection to the most intricate website systems. With a single multi-domain wildcard SSL cert, you can secure up to 250 domains and unlimited subdomains. Comodo PositiveSSL Multi-Domain Wildcard SSL is the cheapest and most efficient solution to secure multiple domains and subdomains. With a fast application and quick approval, this powerful multi-domain wildcard SSL certificate will protect your websites in no time. Its extra features include a static site seal and a $10,000 warranty. Comodo Multi-Domain Wildcard SSL is a Business Validation certificate, ideal for medium-sized companies and e-commerce websites. It secures multiple domains and subdomains and is compatible with all the major server platforms and email clients. Comodo Multi-Domain Wildcard SSL features a $250,000 warranty and a well-known dynamic site seal. Thawte is one of the oldest and well-known Certificate Authorities, and the first SSL provider to issue SSL Certificates outside of US. Thawte SSL 123 Wildcard is a Domain Validation certificate, ideal for startups and small companies. It comes out of the box with Thawte’s famous site seal available in 18 languages, and a $500,000 warranty. You can get this cheap Thawte Wildcard SSL certificate in just 5 minutes without any paperwork whatsoever. Thawte Wildcard SSL certificate is a Business Validation certificate, excellent for e-commerce platforms, small and medium-sized businesses. It includes unlimited server licensing, a $125,000 warranty, and the multilingual Thawte Secured Site Seal. You can obtain this Thawte SSL Wildcard certificate in 1-2 business, providing your documentation is correct and up to date. RapidSSL does exactly what its name implies. It quickly approves and delivers affordable SSL Certificates. RapidSSL Wildcard SSL is easy to receive and configure Domain Validation product. It’s a great solution from personal websites, blogs, online portfolios, and even small businesses. This cheap RapidSSL Wildcard certificate also features a static seal and a $5,000 warranty in the unlikely event of a data leak, or false issuance. GeoTrust is the second largest CA in the world with more than 100,000 customers in over 150 countries. Websites and businesses of all sizes use GeoTrust products to encrypt sensitive data transfers. GeoTrust QuickSSL Premium Wildcard is a Domain Validation certificate best suitable for online shops, startups, small businesses, and NGOs. You can obtain it in under 5 minutes, with no paperwork required. GeoTrust QuickSSL Premium Wildcard comes with impressive extra features such as a dynamic site seal and a whopping $500,000 warranty for your peace of mind. GeoTrust TrueBusinessID Wildcard is a Business Validation certificate ideal for medium-sized companies and e-commerce websites. It features a dynamic site seal to further increase customer trust and a $100,000 warranty against potential damages. You can get GeoTrust TrueBusinessID Wildcard certificate in 1-2 business days as long as your documentation is correct and up to date. Symantec is a web security giant with unbeatable experience and know-how in data encryption and protection. Large corporations and financial institutions use Symantec products on their websites. Symantec Secure Site Wildcard is a Business Validation Certificate perfect for banks and huge systems. It secures one domain and unlimited subdomains with the industry-standard encryption. Symantec Secure Site Wildcard comes with a $250,000 warranty and the famous Norton Secured site seal. You can display it anywhere on your site to further increase customer trust. Symantec Secure Site Wildcard Pro offers the same high-end features as Symantec Secure Site Wildcard, but with a much better warranty. Symantec offers by far the highest SSL warranties on the market, with this particular certificate boasting a $1,500,000 insurance against potential damages. If you’re wondering why can’t you buy an Extended Validation Wildcard SSL certificate, the answer is simple. Wildcard EV SSL certs would require a lengthy and costly verification process, which the leading CAs deemed unworthy and vulnerable security wise. Since EV Certificates provide the highest level of trust and require extensive checks for each web address to which they are assigned, verifying the identity of each subdomain would take ages. The EV certificates have been specifically designed to offer the ultimate assurance to the customers. 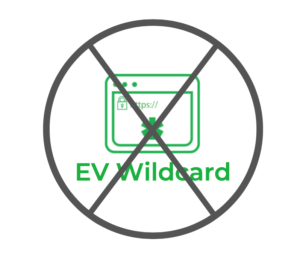 Adding the EV option to Wildcard certificates will only devalue the EV option.